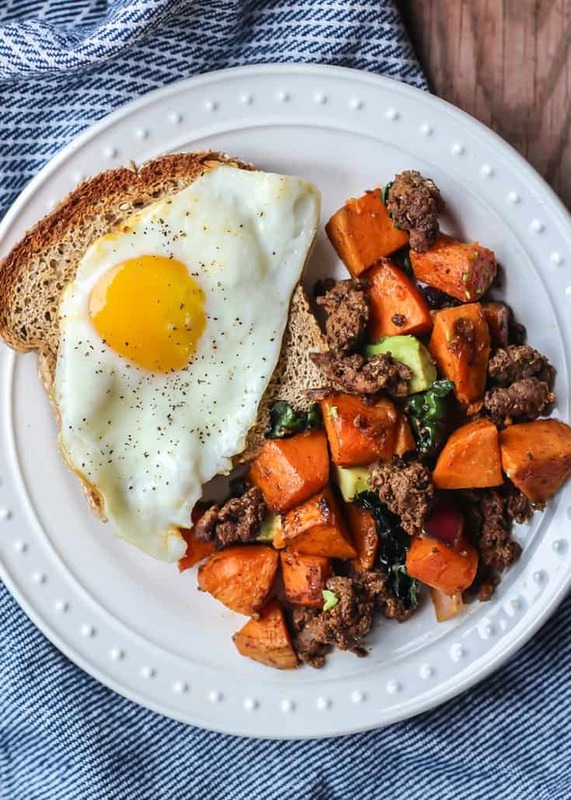 Six ingredients you likely already have in your pantry for this easy Sweet Potato Chorizo Breakfast Hash. Naturally gluten-free, paleo and just real, wholesome foods. Guys, here we go again. Two savory recipes BACK-TO-BACK. 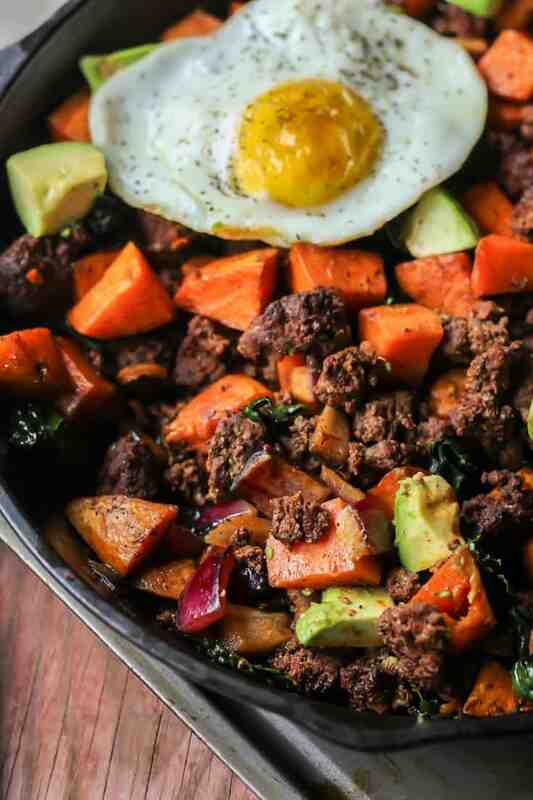 This chorizo breakfast hash recipe kind of happened on accident though. I was at Fresh Thyme after teaching one morning (a typical pit-stop on the way home) picking up some groceries for the week. I browsed the meat section and noticed some prepared burger on sale. We actually don’t buy a ton of burger, because we have venison stocked in the freezer. 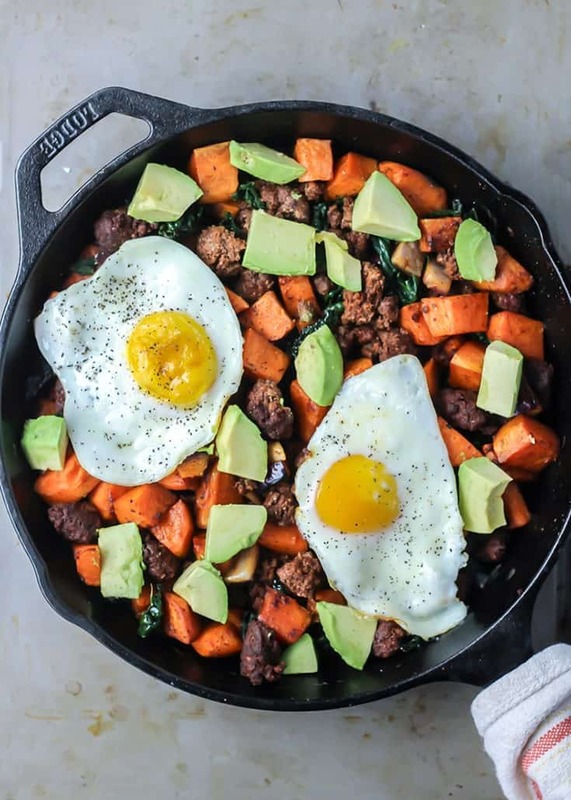 But I noticed chorizo and thought, “What the hell, let’s try something new…” Maybe it is the changing of the seasons, but I’ve also been craving more protein-rich, whole foods lately. 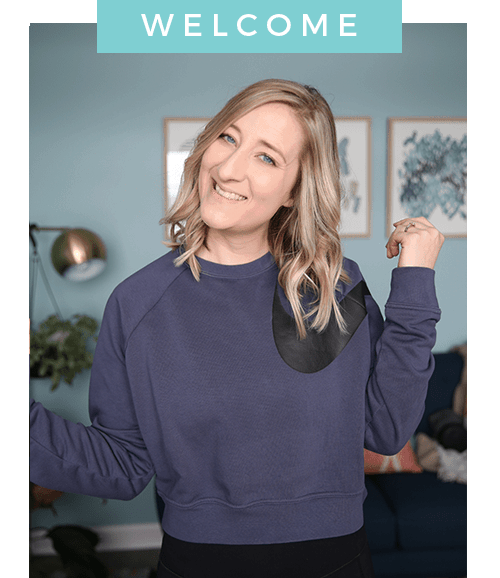 Which may have to do with the lack of baking recipes these past couple of weeks… hopefully you don’t mind! Anyways, the chorizo sat in the fridge for a few days because I honestly wasn’t sure what to do with it. The only chorizo I had was eating out at a Mexican restaurant, probably in a breakfast quesadilla (mighty tasty). 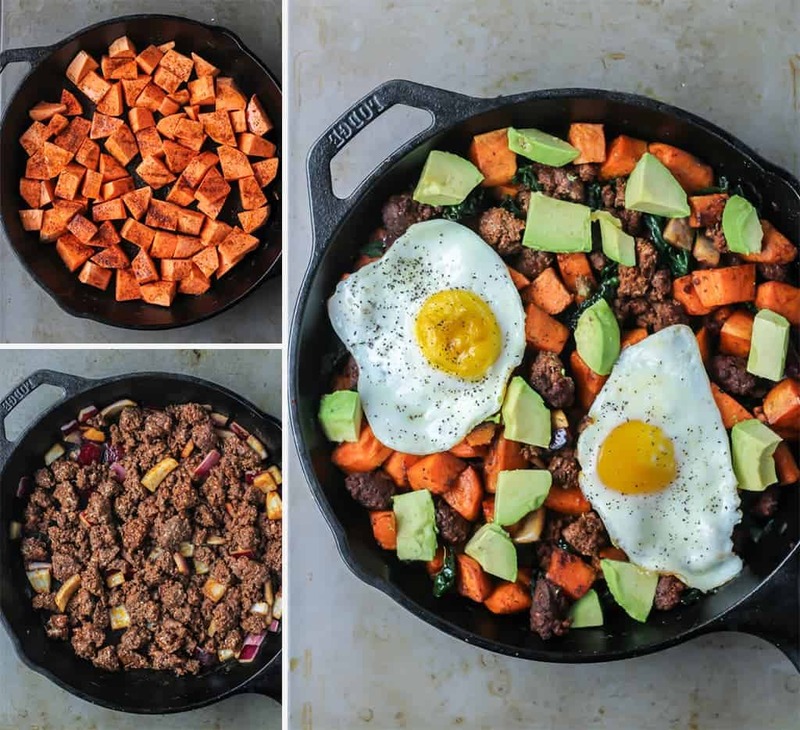 When it dawned on me that the chorizo would be great in a breakfast hash skillet, something really simple that both Drew and I could enjoy for leftovers, I knew what had to be done. 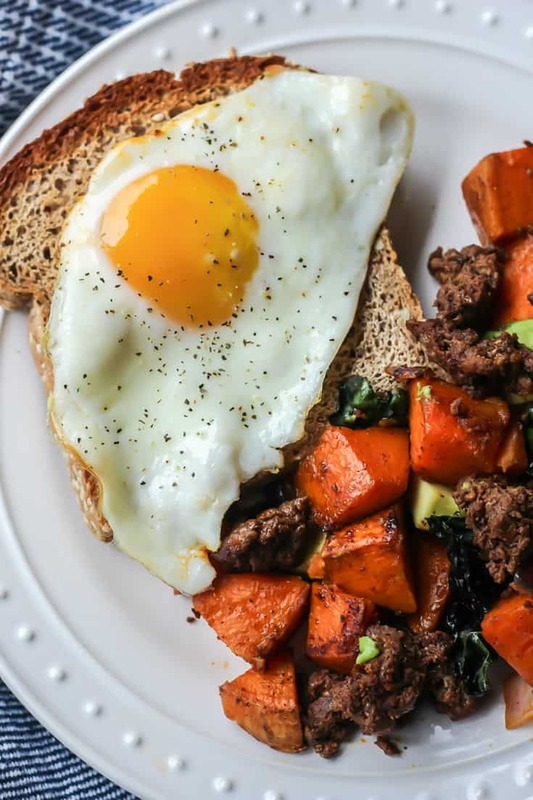 Of course a breakfast hash is nothing new. You barely even need a recipe, to be honest. It is one of those recipes that combines all of the staple meal prep ingredients you likely already have on hand each week (except maybe the chorizo) and takes little effort to throw together. And then you have this really satisfying meal that can be enjoyed as a weekend brunch, brinner kind of night, or easy leftovers. We’re focusing on just real, simple ingredients here that come together for a flavorful and satisfying meal. You start off by cooking the cubed potatoes first until soft. Then add in and cook the onion with the chorizo. After the chorizo has cooked almost all the way through, drain the grease and add in the chopped kale and transfer the sweet potatoes back to the skillet. 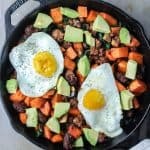 Top with avocados and fried eggs and you have yourself a simple (and delicious) breakfast hash perfect for any time of day. Add oil to a medium skillet and allow to warm. Add sweet potatoes and seasoning, stirring every few minutes. Allow sweet potatoes to cook until slightly soft, about 10-15 minutes. Remove from pan and transfer to plate. In same skillet, add onions and kale and cook down about 1-2 minutes before adding in chorizo. Cook chorizo until no longer pink, breaking into crumbles as it cooks. Drain the grease from the pan before adding in the sweet potatoes back to the pan. Fry eggs in separate pan OR make cavities in skillet and carefully crack egg into each cavity, allowing egg to cook until white has cooked through. You can finish in broiler to cook the yolk a bit more if you’d like, about 2 minutes. Serve with your favorite toast, or enjoy as is! HASHES!!!! I’ve seen so many good recipes for potato/sausage hashes, and I would really like to try one soon. 🙂 I should pin this one. Also, I totally agree that adding toast always tastes good with a yummy runny egg.